Intended to replace the Gloster Meteor F.Mk 4s in service with the Argentine air force, the I.Ae.33 Pulqui II (Arrow II) was designed by a team headed by Dr Kurt Tank, roughly inspired by the Ta 183. It embodied some of the results of the advanced research carried out in Germany during World War II, incorporating a shoulder-mounted wing with 40deg of sweep-back, and a T-tail with all-swept surfaces. 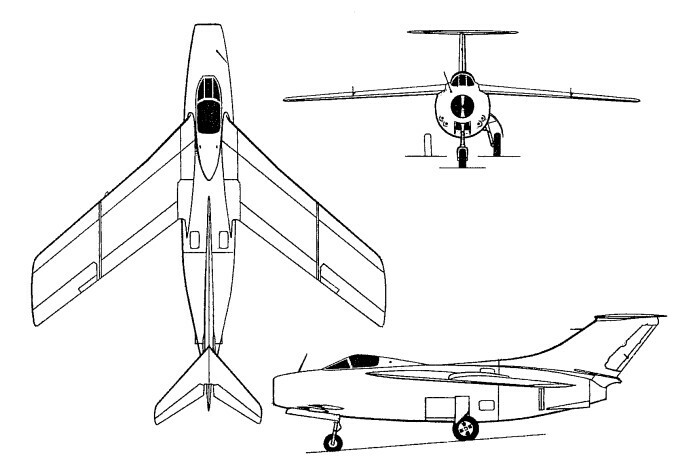 Landing gear was retractable tricycle-type and power provided by a Rolls-Royce Nene turbojet mounted in the rear fuselage. The pilot was accommodated on an ejection-seat in a pressurised cockpit, protected by armour and a bulletproof windscreen, and a sliding canopy that could be jettisoned in emergency. There were four prototypes of Pulqui II constructed in a period of nearly 4 years (1950-53), the first made its maiden flight on 27 June 1950 but it was not until 18 September 1959 that the last was flown. The first three were lost in accidents (Otto Behrens, the test pilot died; a few days before his death he said that the airplane was "the worst he had ever experienced as a test pilot"). In the intervening period the Dr Tank and his team had left Argentina. These factors, coupled with serious financial problems, meant that development was initially halted in 1953, and finally cancelled with the fall of Peron in 1955.